In Jim Butcher's best selling Dresden Files books, the forces of good bond together into an organization called the Paranet in a desperate attempt to turn the tides of their equally desperate war against big baddies like the Fomor and the Denarians. 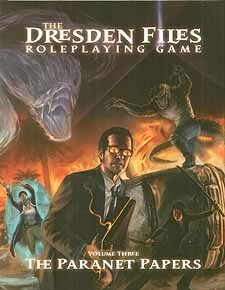 Now you can bring the Paranet to your Dresden Files RPG game with the Paranet Papers supplement. Updated information through the Dresden Files novels Changes, with hint of Ghost Story. Detailed information on four key Dresdenverse times and places: Las Vegas, the Russian Revolution, the Neverglades, and Las Tierras Rojas/the Red Lands. Detailed rules and setting information for navigating the spirit world known as the Neverever. Updated magical systems, including new material on soulfire, sponsorship, and thaumaturgy. New and updated creatures to populate your game, including demons, archangels, creatures of the Neverever, and scions. Character updates and new characters introduced to the Dresdenverse. The Paranet Papers. Because playing a wizard wasn't dangerous enough already.